Industrial varieties: the weather was again unfavorable making the markets more stable. Offer and demand remain very low but balanced. Globally low industrial demand, with some variation depending on buyers/factories. 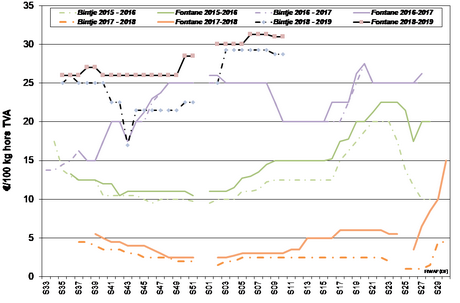 Bintje: “friable quality”: max 15% floating at 1,060 g/l and PSE min 335g/5kg: 27.50 to 30.00€/q depending on the quality (PSE, cooking…), the caliber and the buyer. Stable market. Highest prices for the nicest lots of very good quality, mainly for fresh fries. Bintje plant: Dutch plant, class A, returned March 2019, by 5 tons, in bags, hTVA: very little trade due to a lack of demand. The carnival and good weather tempered the markets last week. Belgian industrial buyers were more discreet. The removal of contracts by the Dutch companies was fast, but not a lot is happening besides those volumes. The surplus from the contracts were negotiated mainly at 30€/q, on a market that is less tense, except for Innovator at 32€/q. 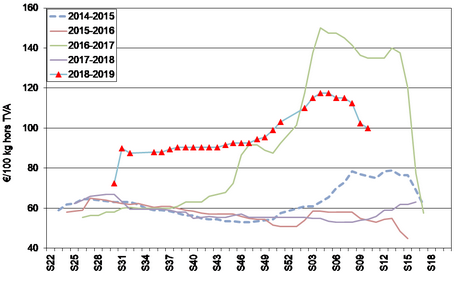 The quiet trend has tightened prices between 30 and 33.5€/q for industrial varieties, and between 26 and 28€/q for export. 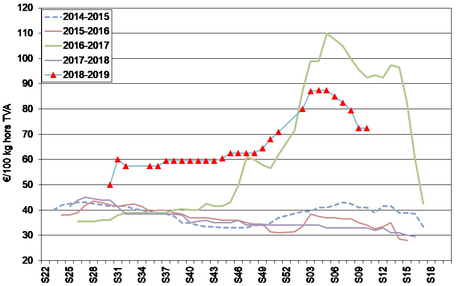 The fresh markets are also calmer: producer prices between 30 and 38€/q depending on the variety and quality on the domestic market, and between 26 and 28€ for export, with only a moderate demand for red varieties from Portugal, and little trade to Africa. No major evolution on the industry market, but a contrasted situation depending on the buyers: some are early to remove the contracts, while others are not, some buy on the free market, some are absent...Given the low stocks, questions about the end of the season arise. Some factories announce longer and earlier closures than usual, due to a lack of raw material. For the export, the market is rather high and dynamic, with regular volumes to Eastern Europe and Germany, while Spain is a bit slower. The demand for friables in export is persistent, also for red varieties to Hungary, Romania and Portugal. 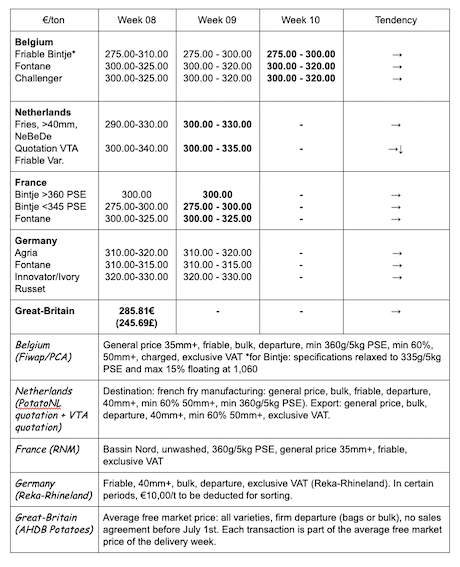 Producer prices vary greatly from 29€/q (multipurpose varieties) to 50€/q (firm flesh of top quality). French export at its highest volume since 2014 (source: customs): the export of fresh French potatoes from August to December reached 674,645 tons, which is 5% more than last year. The first client is Spain with 197,130 tons, closely followed by Belgium with 189,956 tons, which shows the strongest progression (+60,000 tons, or +47%!). Italy comes third with 94,575 tons, a clear decline (-24%). The Middle-East and Eastern Europe are behind. On the fresh market (Rhineland), on March 1st, stable prices for firm flesh at 40€/q for the storage output refrigerated crates, and for soft flesh at 38€/q for storage output refrigerated crates. 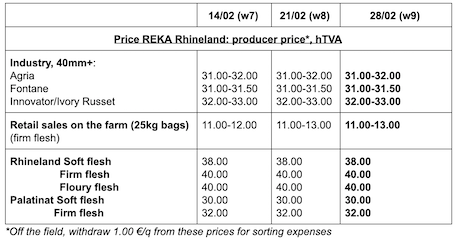 For firm flesh on sale at the farm (Rhineland), firm prices ranging from 11 to 13€ per 25kg bag (slight increase). 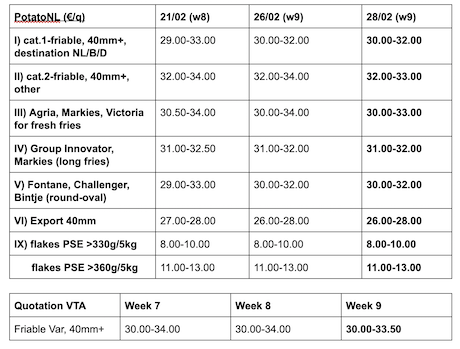 Potatoes for industry (fries), unchanged but firm prices for Fontane: Agria at 31.00-32.00€/q, Fontane at 31.00-31.50€/q, Innovator at 32.00-33.00€/q. Average producer price (all markets) week 8: 28.58€/q (compared to 28.61€/q in week 7). The first figures show areas of 5,600 ha, which is 12% more than in 2018. The region of Seville sees the highest increase (+20%) with 3,700 ha, while the other regions have not evolved much.